I've had this stack of fabric pulled and set aside for at least 18 months. 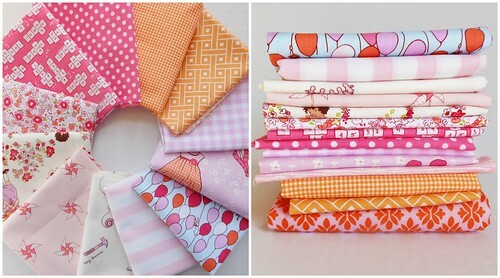 Pink and Orange Fabric Pull, a photo by simple girl, simple life on Flickr. I was waiting for the "perfect" design inspiration to hit me over the head. When that didn't happen...well, nothing happened actually. So with a strong desire to move on I've chosen an easy (and fast) design. Love your nice bright color choice. I have a lot of those same prints...can't wait to see what you do with them.